It is a pretty rare occurrence for Nick not to be working on the weekend so whenever he has a day off we always try to make the most of it. It would be a waste not to! 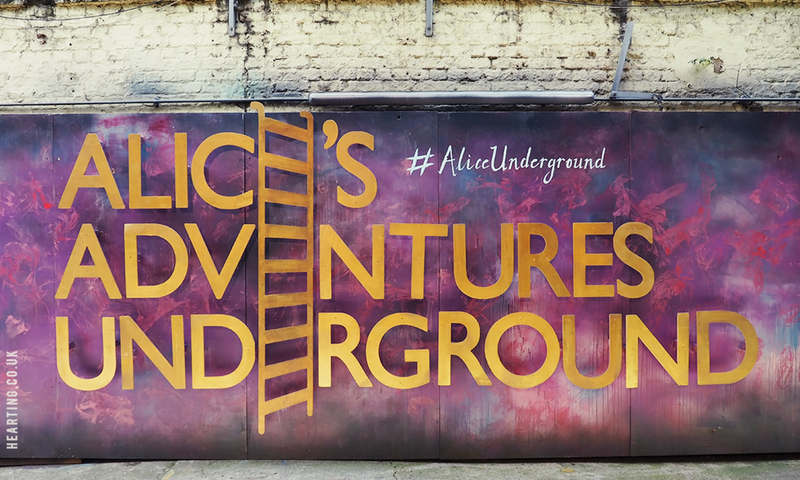 Last Sunday was one such occasion so we decided to book tickets for the immersive theatrical experience named Alice’s Underground Adventure. I’d heard really good things about this unique adaptation of Alice In Wonderland by chance on the radio so I was really curious to try it for myself. Aside from this description on the Alice’s Adventures Underground website, I didn’t want to read any reviews for fear of spoilers so I wasn’t too sure on what to expect. I don’t want to give too much away in case you’re thinking of going, but Nick and I had such a fun and memorable time! From the impeccably detailed set designs, the bizarre scenes and the actors’ energy and talent – it was all truly incredible and I couldn’t fault it. They’re really not lying when they say it is an immersive theatrical experience, there’s a lot of audience involvement which results in a lot of clever improvisation from the actors. What’s truly amazing about this experience is that you decide which path you take on your adventure so it’s different for everyone. Even Nick and I had completely different experiences although our paths did cross at times. I guess this was my only negative point of the whole experience, it was a shame that we were separated although we probably could have said something to stay together! As you are led from set to set you meet different characters, get completely confused as to what’s going on (which is part of the charm!) because it is all so intricate and yet it all mostly makes sense by the end. Some of my favourite characters during my journey through Wonderland were The White Rabbit, Tweedle Dee and Tweedle Dum and Humpty Dumpty. The magic doesn’t end underground either, there’s an Alice-themed bar with cocktails and food aswell as a photo booth and flamingo croquet to enjoy before and after the show. Alice’s Adventures Underground lasts around 90 minutes and has multiple performances per day. It is on at the Vaults Theatre (near Waterloo Station) in London until the 23rd of September 2017. There are a couple of ticket options, standard tickets ranging from £39.00 to £54.00 and premium tickets which include a tea party cocktail, an Alice programme, one of the Queen’s edible treats and an after show cocktail costing between £56.50 and £71.50 depending on when in the week you go. One thing to note, you’re not allowed to take any photographs during the show, hence my lack of photographs. I guess this is to prevent distracting the actors and giving too much away! If you love Alice in Wonderland, outstanding acting or beautiful set designs and are up for a really fun experience I would highly recommend experiencing Alice’s Adventures Underground – it’s worth every penny. Would you be up for visiting Alice’s Underground Adventure? Have you ever experienced an immersive theatrical performance? Previous Post Nails #87 + GIVEAWAY!